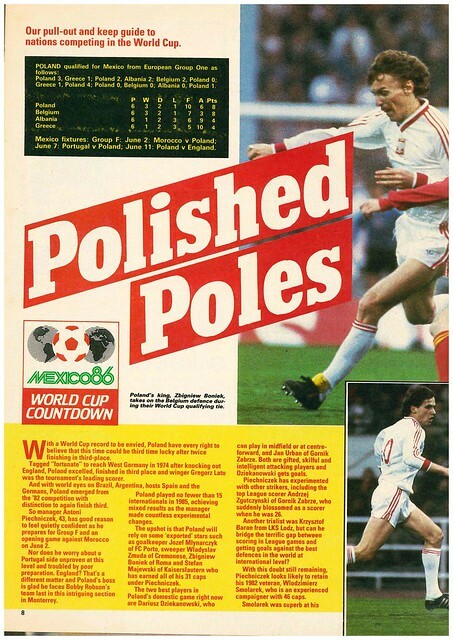 In just under 24 hours time, Northern Ireland will be playing their opening match of Euro 2016, against Poland in Nice, exactly 30 years to the day (and it’s Pat Jennings birthday) since their last match in a major finals, against Brazil in the 1986 World Cup in Guadalajara. 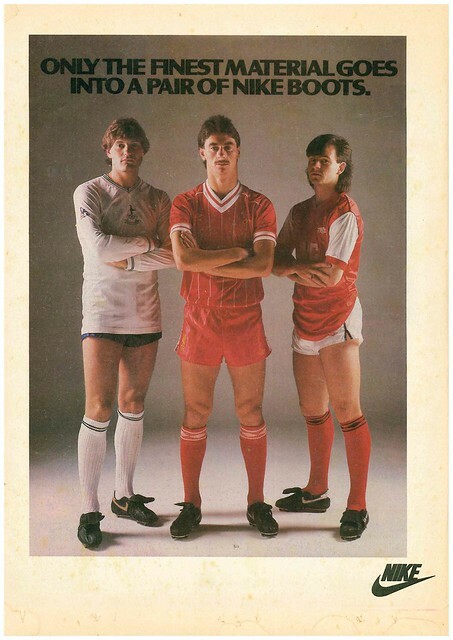 When you’ve waited 30 years, what’s another day? 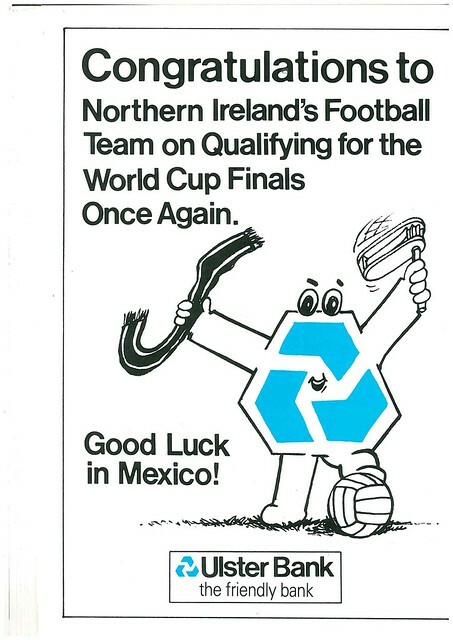 But what were Northern Ireland fans reading as they made their way to Mexico in 1986? 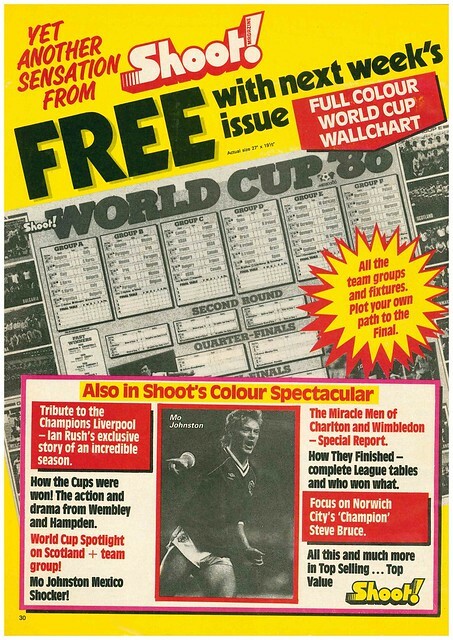 It’s possible they were reading the official souvenir, which would have cost them £2.50, just over twice as much as the similar guide for Spain 82. 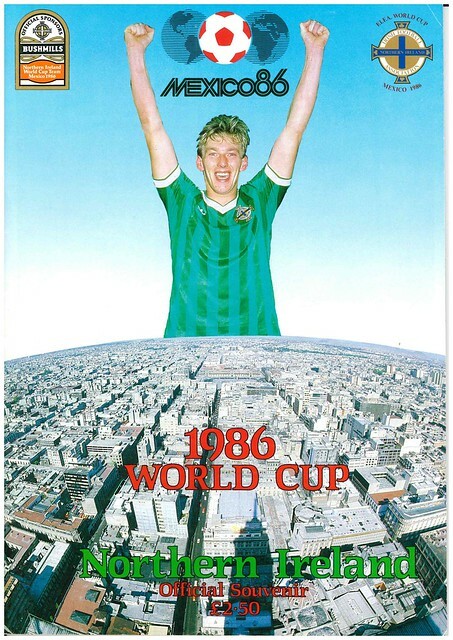 The cover star is Alan McDonald, towering over the skyline of Mexico City. 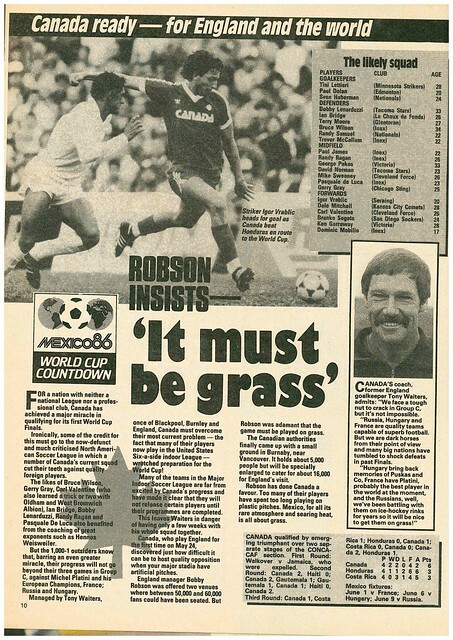 Despite only playing twice in the qualifiers, McDonald became one of the icons of the campaign, after his post-match interview at Wembley where he politely suggested that anyone who thought the 0-0 draw was a fix was ever so slightly wrong. 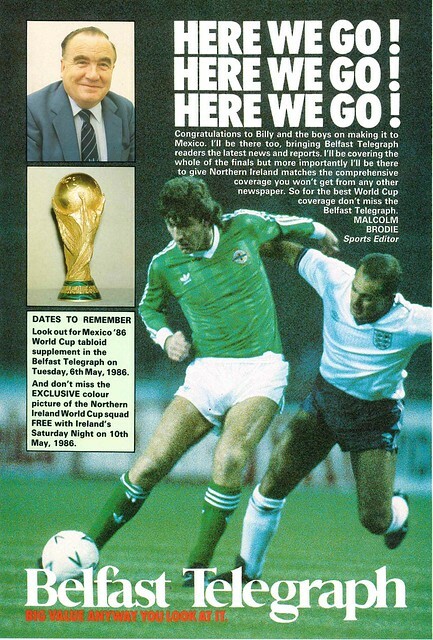 As you open the publication, there is an advert for Belfast Telegraph, with Malcolm Brodie promising comprehensive coverage, as well as a preview supplement in the 6th May edition, and a Northern Ireland squad poster in the 10th May edition of Ireland’s Saturday Night. 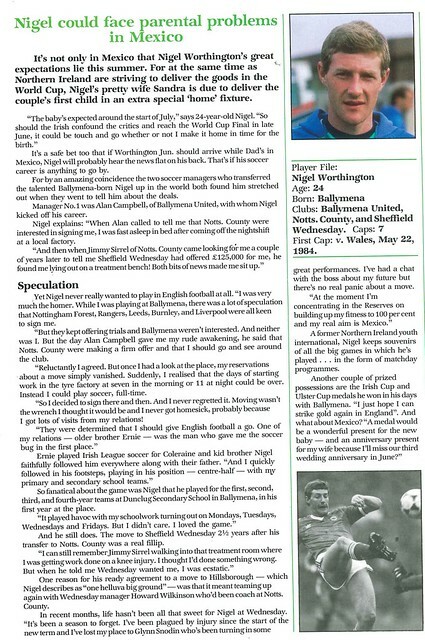 IFA President Harry Cavan writes the foreward, where he states he is confident that Northern Ireland can reach the Quarter-Finals. 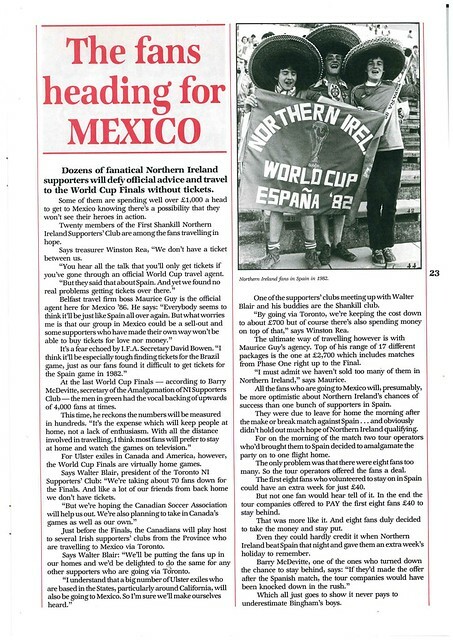 Ivan Little, co-editor alongside Billy Kennedy, just like in 1982, writes a double page spread on the logistics of Northern Ireland’s campaign, with one of the first tasks being for IFA Secretary David Bowen to inform FIFA that Northern Ireland wish to participate in the finals in Mexico. 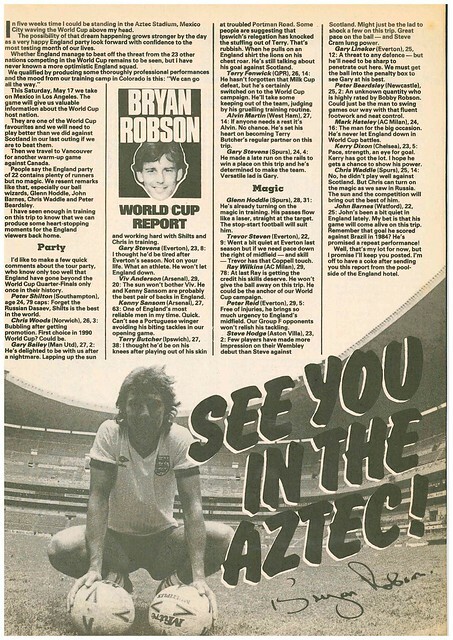 Bowen also visited an Adidas factory to look at specially adapted kits to cope with the heat in Mexico, as well as ensuring the team had 10,000 bottles of water, and ensuring passports and visas were up to date. 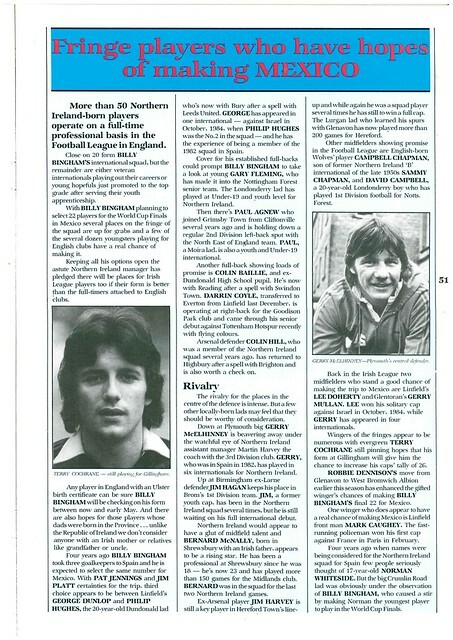 There are full page player profiles throughout, the first being Sammy McIlroy followed by Pat Jennings. 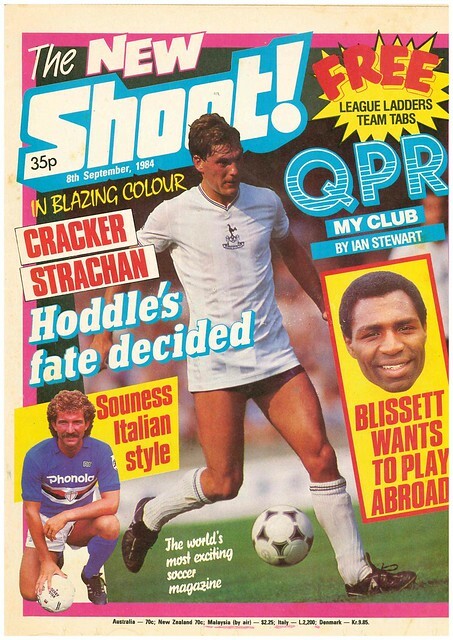 Jennings will be playing in Mexico on his 41st birthday, and comments that he spent his 21st birthday playing in Mexico, for Tottenham Hotspur in an end of season tour. 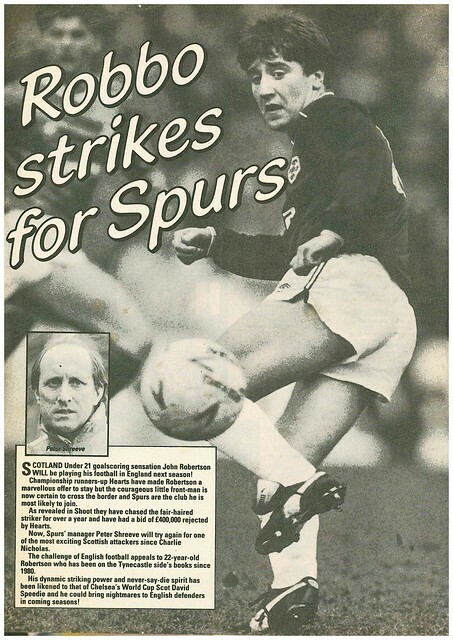 Jennings is back at White Hart Lane keeping himself in shape for Northern Ireland’s matches. 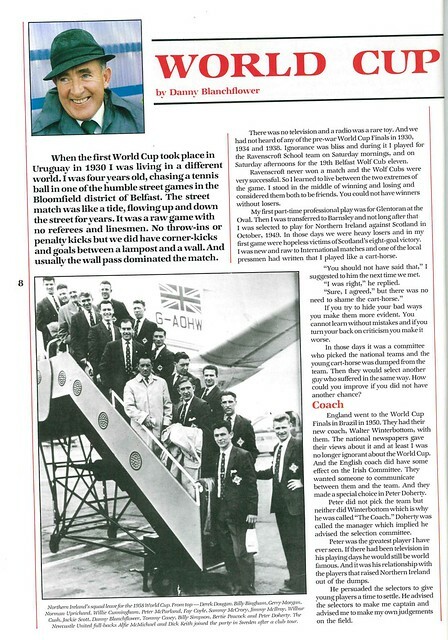 Danny Blanchflower gets a double page spread looking back at his World Cup memories, though he admits not remembering much of the 1930 tournament as he was only 4 years old. 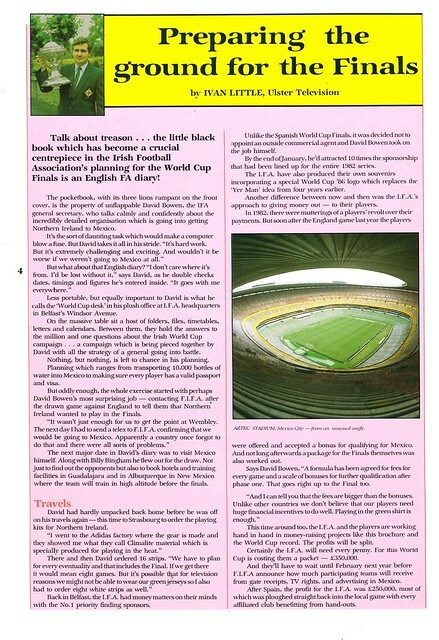 Blanchflower comments that Winter Winterbottom as England’s first manager instead of a committee inspired the IFA to do likewise with Peter Doherty, as well as suggesting that the increase of cars parked in streets as had a negative effect on the number of skillful footballers in the UK in recent decades. 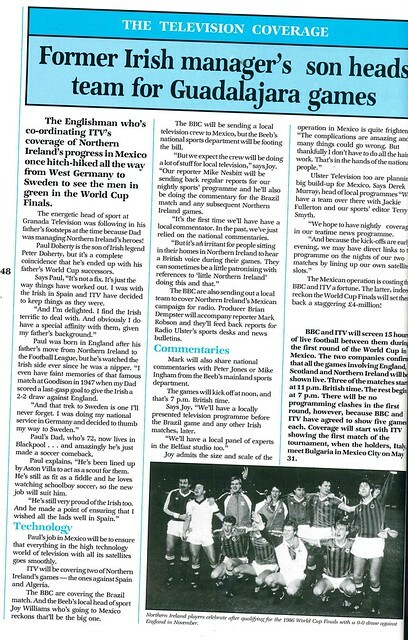 There is a full page titled “The Road To Mexico”, listing the results and team line-ups of Northern Ireland’s eight qualifiers. 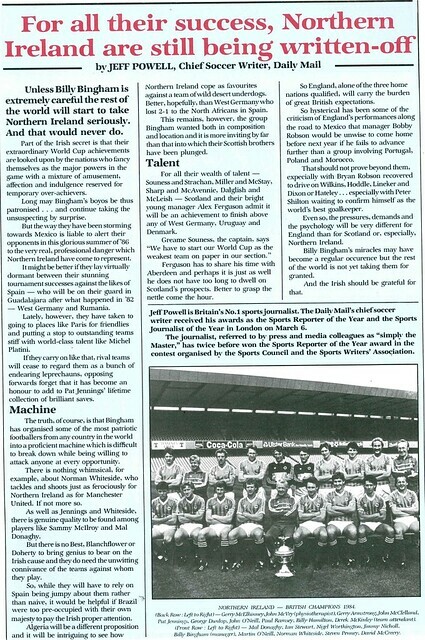 Jeff Powell of the Daily Mail gets a full page feature where he states that Northern Ireland are still being written off by many despite their success in recent years. 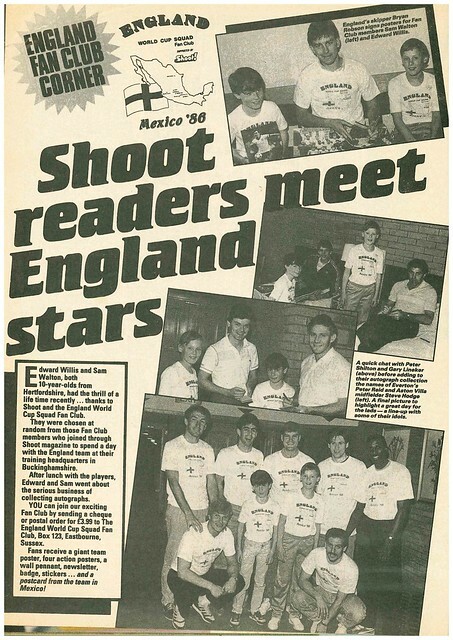 George Dunlop writes about his World Cup experience in Spain, and the daily routine of the squad, which included sports competitions on their day off with Milky Ways and Mars Bars as prizes. Malcolm Brodie writes about Northern Ireland being happy to be based in Guadalajara, and getting a hotel 10 minutes from the airport and 15 minutes from the City Centre. 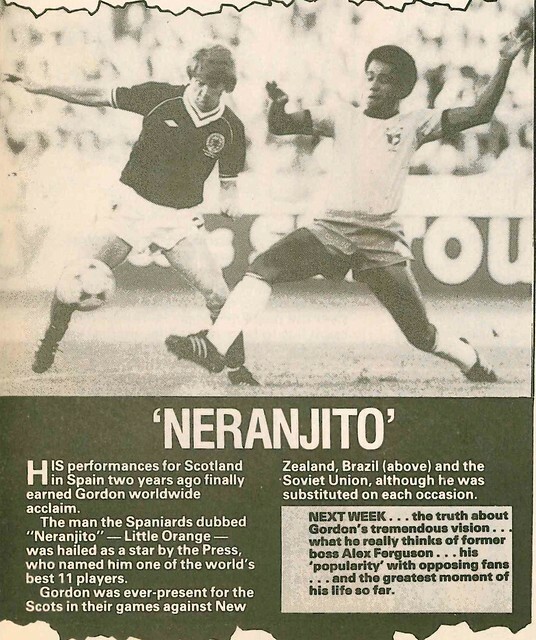 Despite not having played an international since 1977, George Best gets a profile. 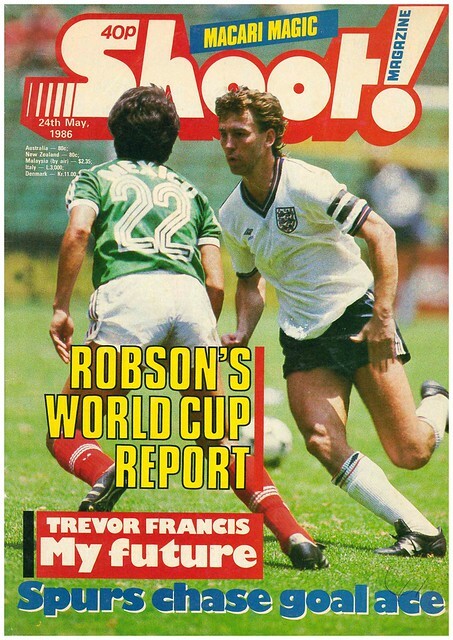 His involvement in this World Cup will be as a pundit for the BBC, having been one for ITV in 1982. 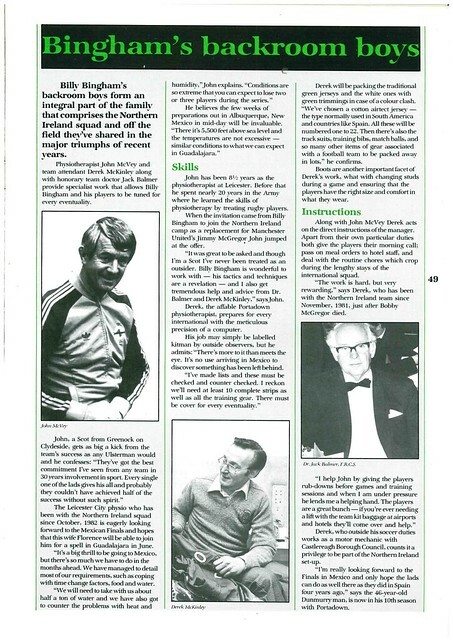 There is also a mention of his son Calum, who has just developed an interest in football, but states that if he was to become a footballer, he could be eligible to play for England or USA instead of Northern Ireland. 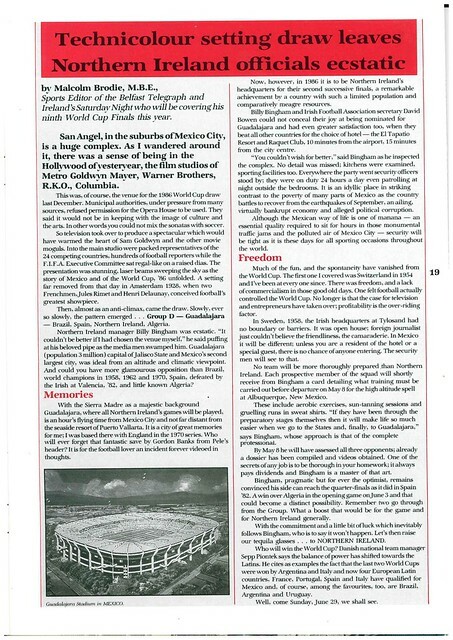 There is a feature on the fans travelling to Mexico, most without tickets, such as First Shankill Supporters Club, though USA and Canada based supporters clubs are excited by the Mexican adventure, viewing them as virtually home games. 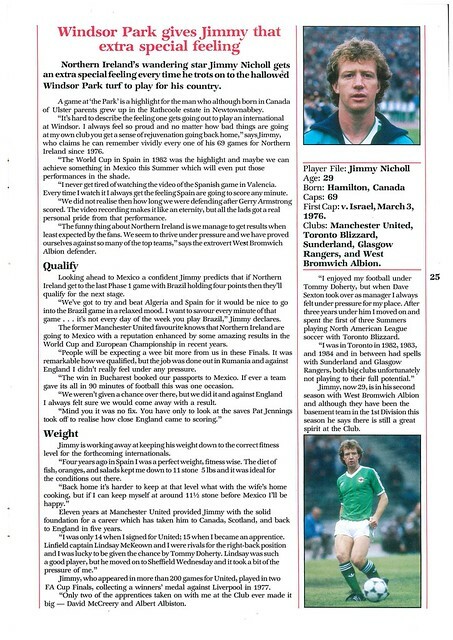 We return to player profiles, with one of Jimmy Nicholl, now Assistant to Michael O’Neill, and Norman Whiteside, who reveals that relatives send him Potato Bread and Soda Bread, which he can’t get in England, in order to make an Ulster Fry. Whiteside also avoids talking about his love life, amid rumours he is soon to be married. 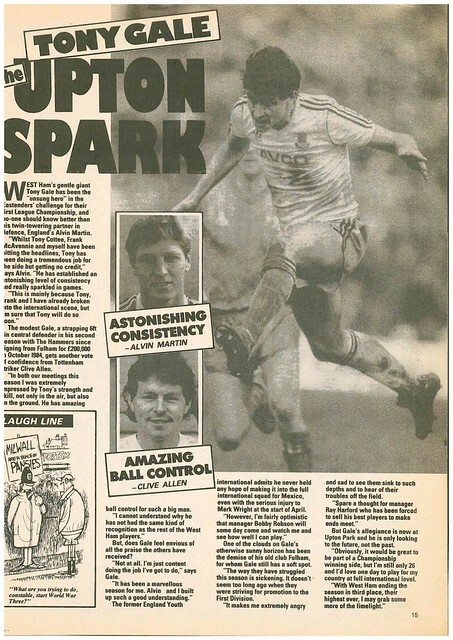 The summer of 1986 was going to be memorable for Nigel Worthington, as his wife is due to give birth to their first child at the start of July, meaning it could be touch and go for thim to make it home in time if Northern Ireland got to the final. 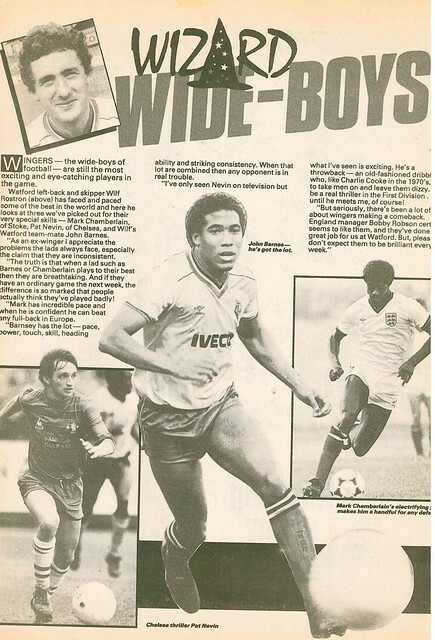 Worthington recalls how he discovered about his move from Ballymena United to Notts County lying in bed after a nightshift at a local factory, while revealing that he became interested in football after watching his older brother Ernie play for Coleraine. 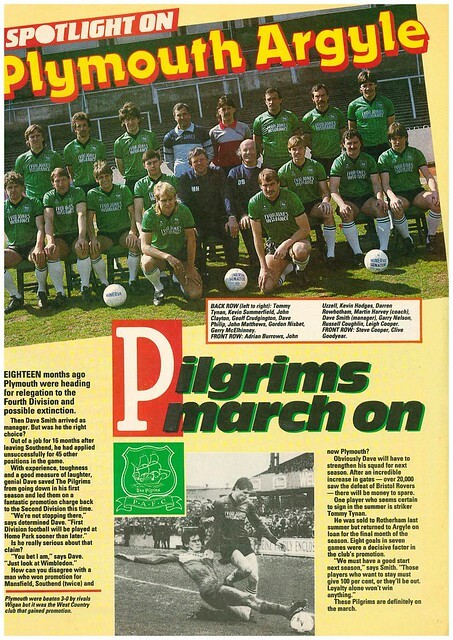 Billy Bingham gets a double page feature by Billy Kennedy, stating he believes friendlies against France, Denmark and Morocco are perfect preparation for the World Cup. 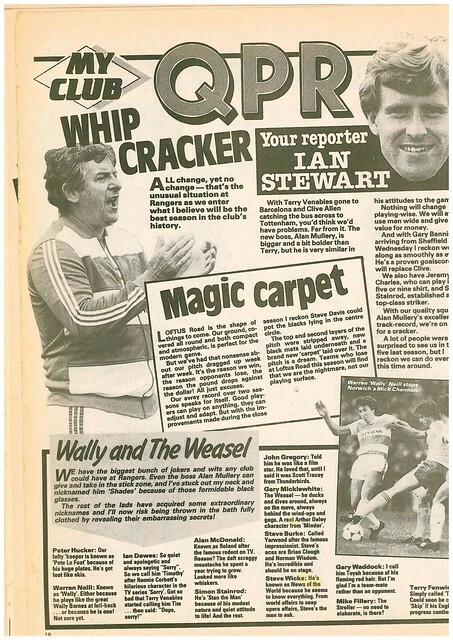 Ian Stewart’s profile reveals that he wanted to be a popstar, forming a band in his youth, whose name was too rude to be published in this book, and performed a concert at Belvoir Community Centre. 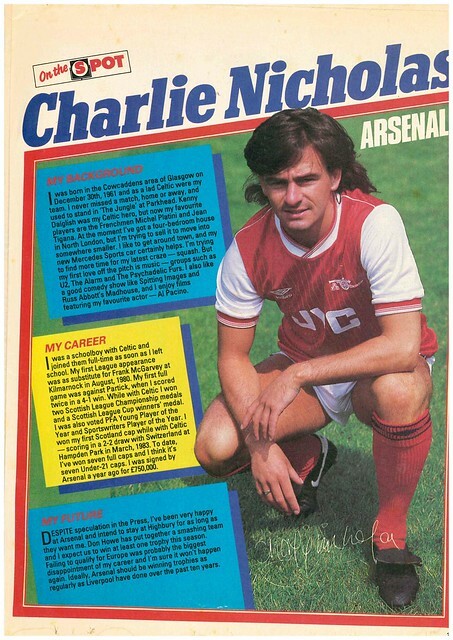 He also reveals that he’s not to fond of playing for former Linfield player Iam McFaul, as he supports Glentoran, and writes jokes for a football magazine, using jokes about Linfield and Glentoran but changing them to Arsenal and Chelsea for an English audience. 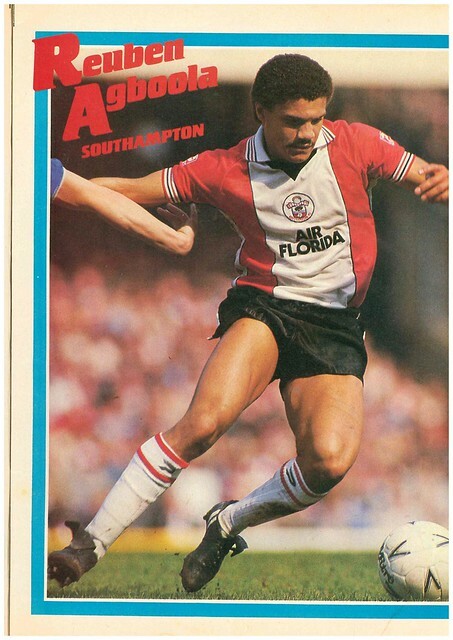 John O’Neill states he won’t be leaving Leicester unless Liverpool or Manchester United make a bid for him, but he is hoping to be Brandywell bound to take in a Derry City match, in their first season in the League Of Ireland. 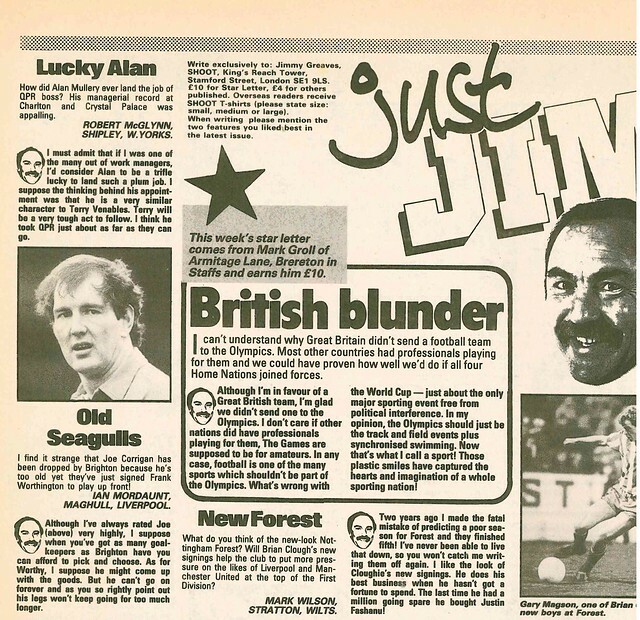 Jimmy Quinn reveals that the winning goal he scored in Romania came when he was wearing a pair of Jim Platt’s boots, having picked up the wrong pair at the Blackburn Rovers training ground before meeting up with the Northern Ireland squad. 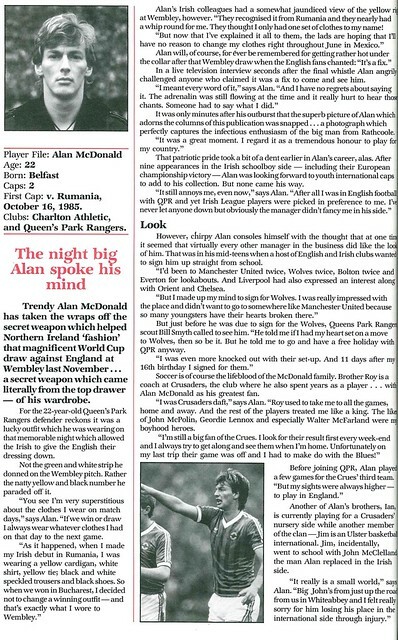 Cover star Alan McDonald is profiled, where he declares he meant every word of his post-match interview at Wembley. 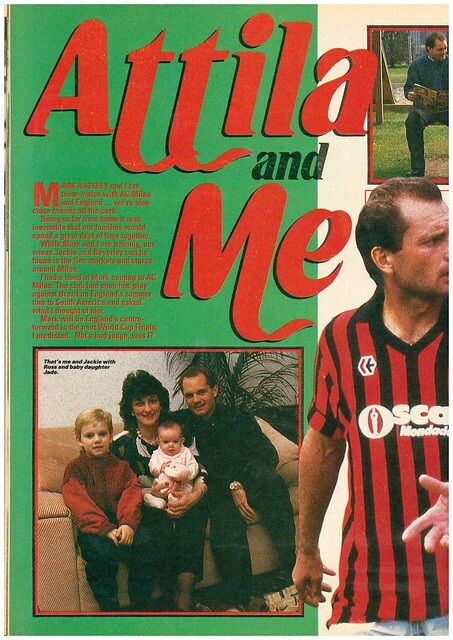 He comes from a sporting family, with an older and younger brother playing for Crusaders, and another brother Jim (not that one) being a Basketball international. 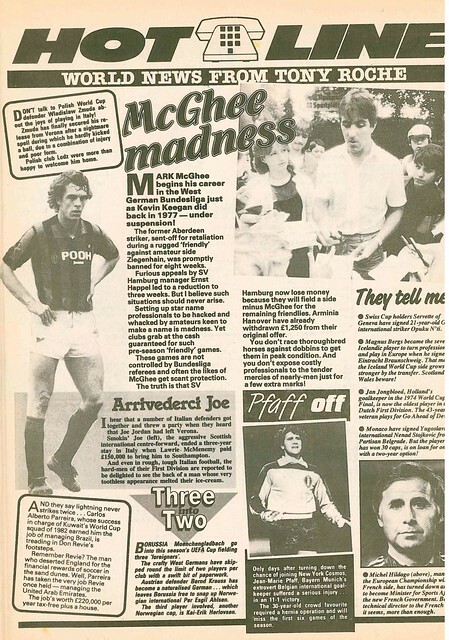 McDonald took the place of John McClelland during the campaign, and it was revealed that McClelland, from Whitehead, was in the same school as the previously mentioned Jim McDonald. 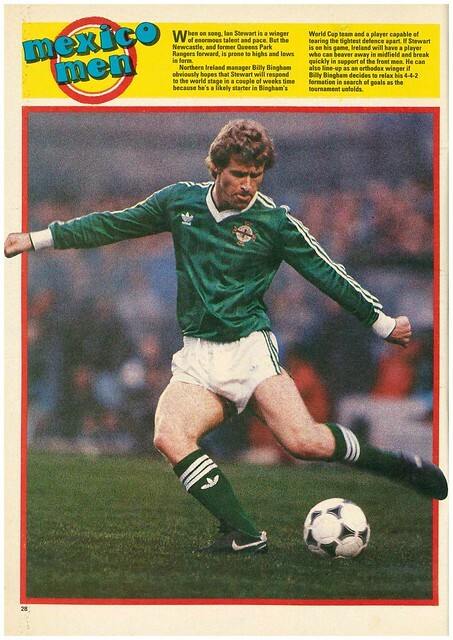 Like his fellow Ballymena native Nigel Worthington, Steven Penney has a domestic arrangement scheduled this summer, with his wedding taking place two days before the final, which will be an awkward clash if Northern Ireland. 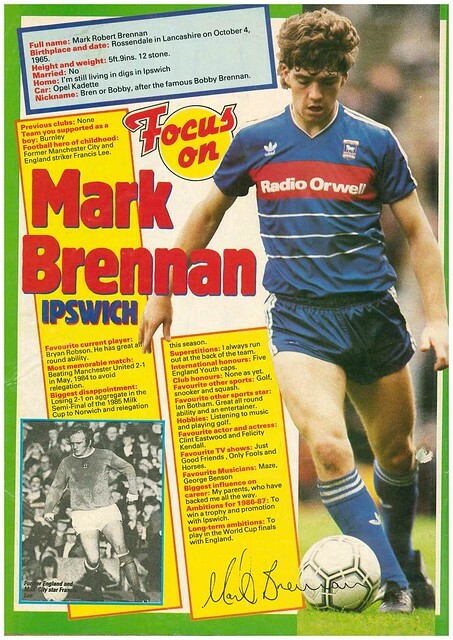 His wife is also from Ballymena, but they didn’t meet until mutual friends suggested they get together to combat loneliness in Brighton with her being a student at the local univeristy, and him playing for Albion. 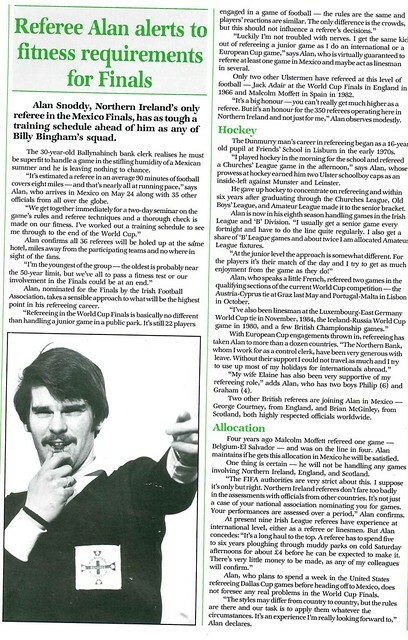 There is a profile of Paul Doherty, Granada Head Of Sport, who is co-ordinating ITV’s Northern Ireland coverage, just as he did in Spain in 1982. 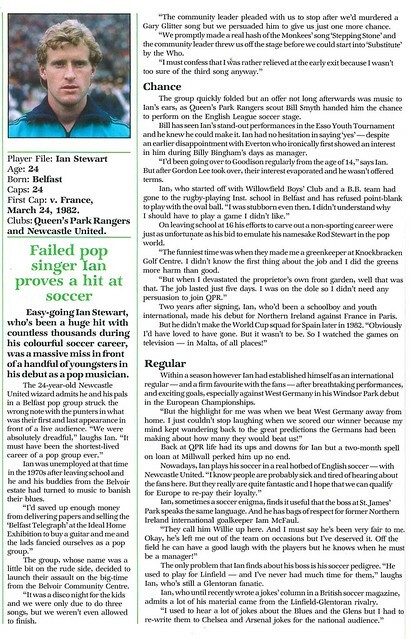 He hitch hiked from West Germany to Sweden to watch Northern Ireland in 1958. 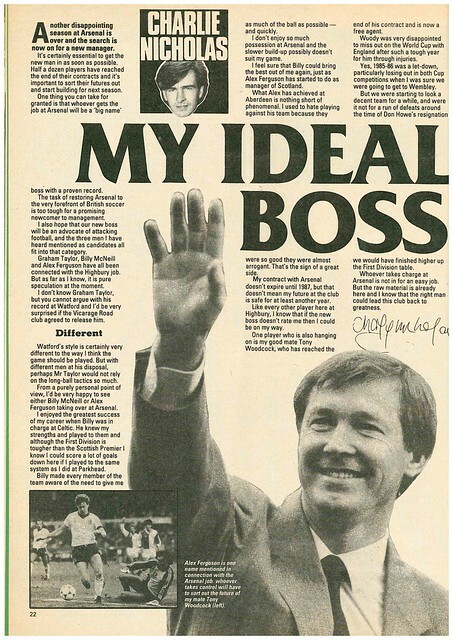 He had good reason to, his dad was the manager, Peter Doherty. 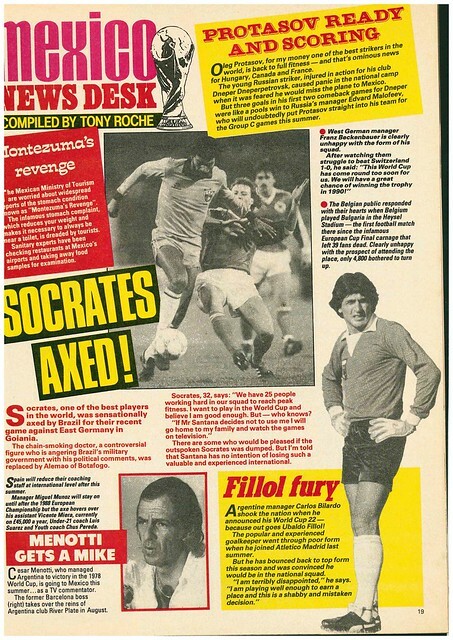 His dad, now 72, is still active in football, working as a a Scout for Aston Villa. 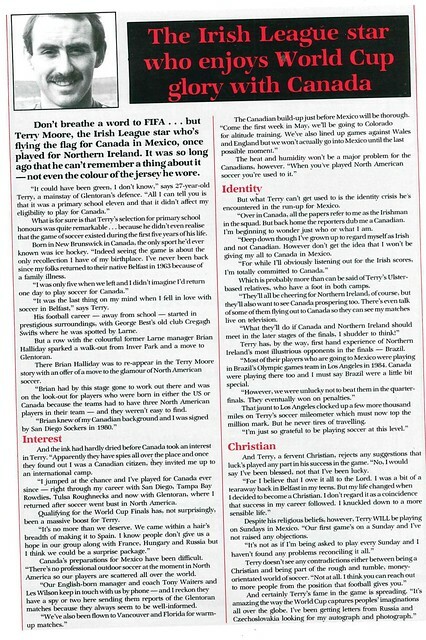 Doherty is profiled as part of a feature on the media coverage. 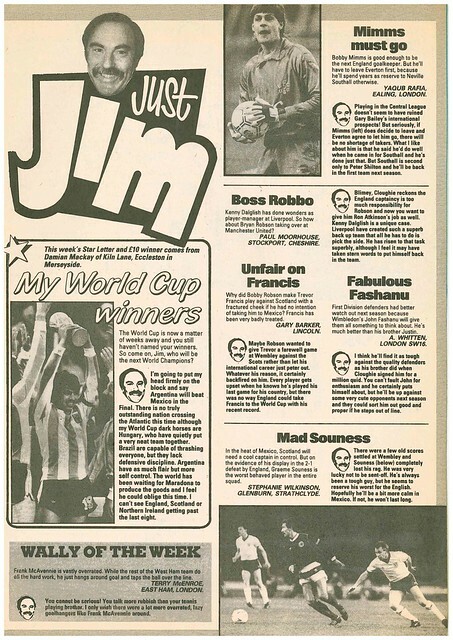 ITV will be showing the games against Algeria and Spain live, with Jackie Fullerton doing a live report on UTV’s teatime news. 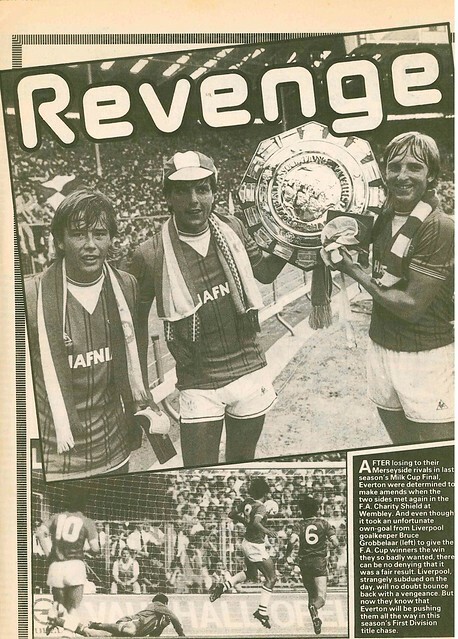 If the name sounds familiar, that’s because he created Paul Doherty International, who produce commercial sporting DVDs, most notably for Manchester United. 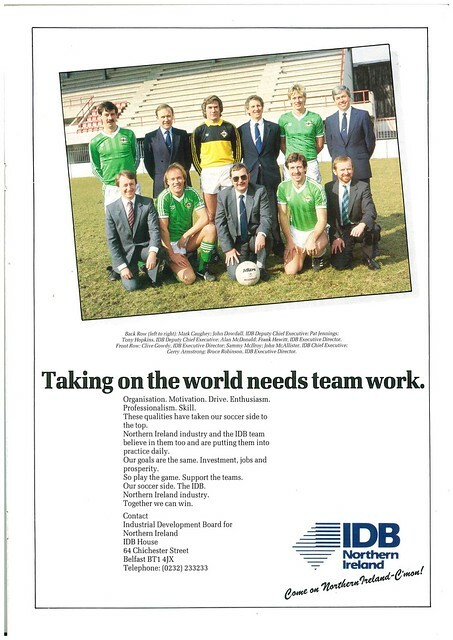 Sadly, Paul Doherty died earlier this year. 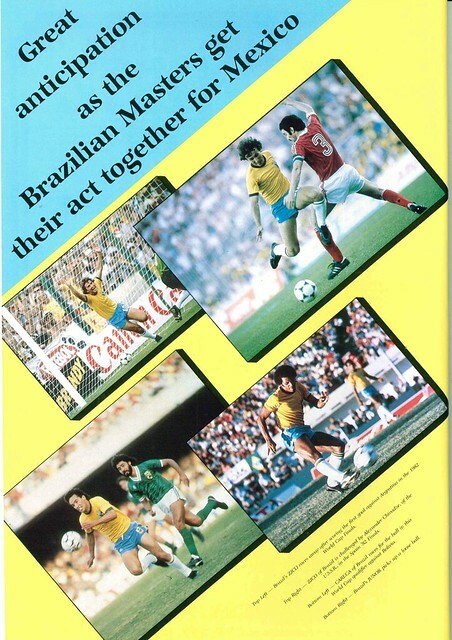 BBC will show the final group game against Brazil, with Mike Nesbitt (Yes, the leader of the UUP) commentating on the network. 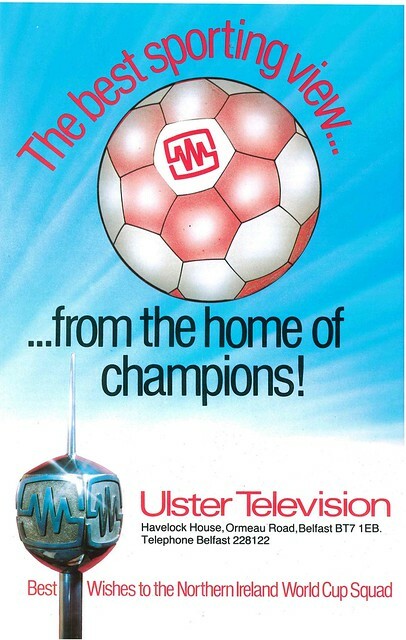 That game will have BBC NI doing build-up from a studio in Belfast instead of the network coverage from London that viewers in England, Scotland and Wales will get. Nesbitt will also be working as a reporter for BBCNI’s teatime news. 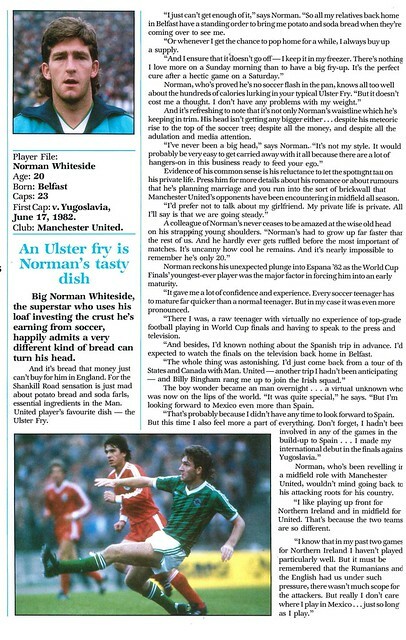 Mark Robson will be doing Radio Ulster commentary on the games. 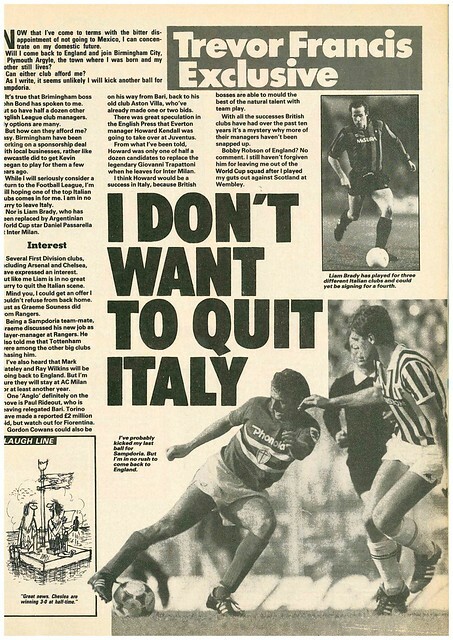 DISCLAIMER – The article says ITV broadcast the opening game of the tournament between Italy and Bulgaria. 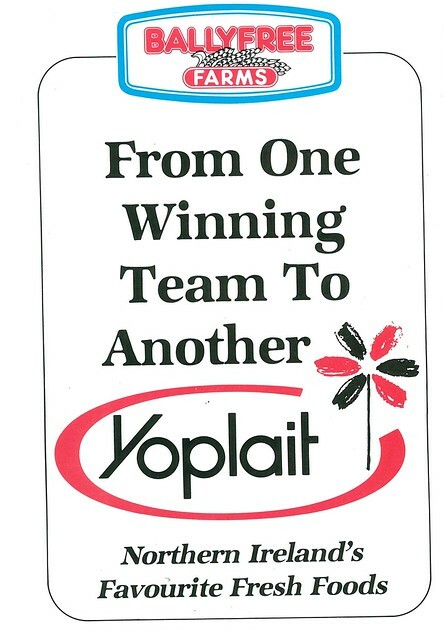 This advert suggests it was on the BBC. So it was either simulcast, changed after the publication went to press, or the article is wrong. 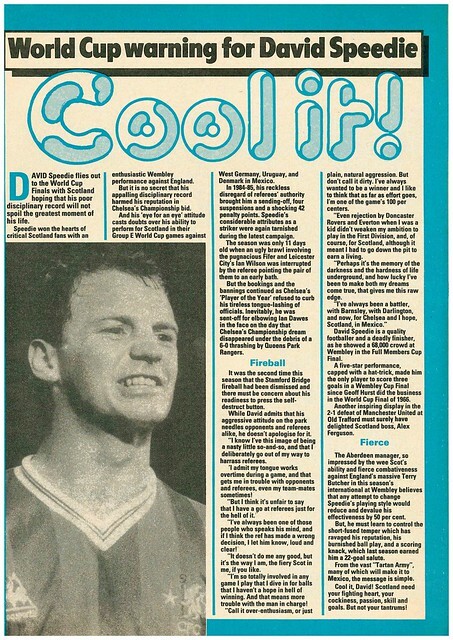 There is a full page feature on those hoping to make a late claim for a place in the squad, Darrin Coyle, Paul Agnew, Robbie Dennison and Bernard McNally. 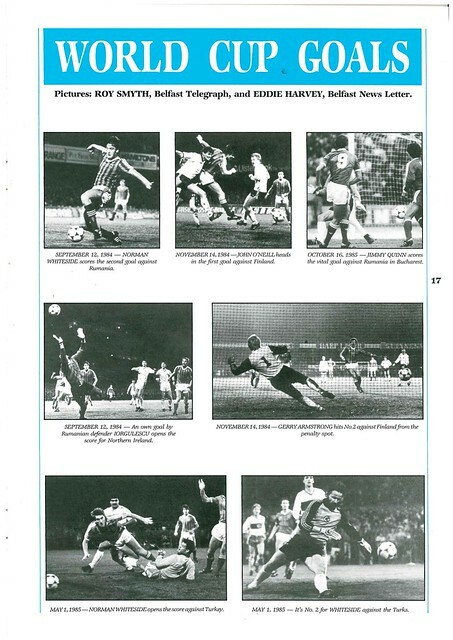 Alan Snoddy gets a profile, as he aims to follow in the footsteps of Irish League referee Malcolm Moffett, who refereed Belgium v El Salvador in 1982, while Canada also get a profile, due to Terry Moore of Glentoran playing for them. 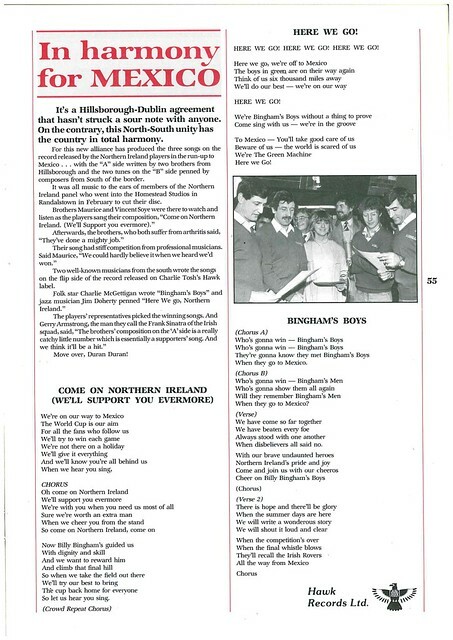 It would have been rude not to have a song, and Northern Ireland had two, with the players singing vocals on them, and comes complete with a lyrics sheet. 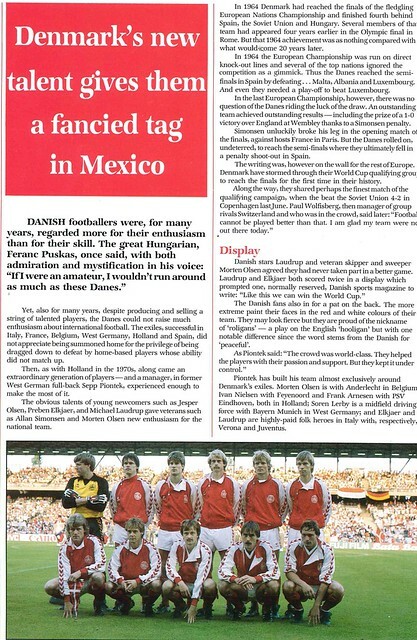 The article suggests the songs were so good, that Duran Duran should step aside. 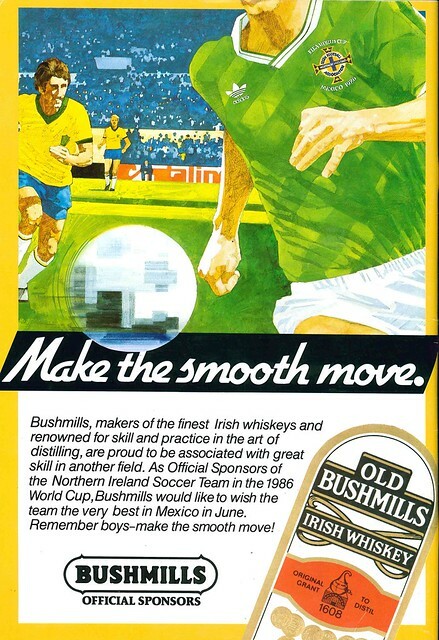 Northern Ireland’s three group opponents – Algeria, Spain and Brazil get a profile, as do Denmark, who they would face in a warm-up friendly, before ending on adverts for IDB (What Invest NI was known as in the 1980s) and Bushmills.